Honey mushrooms, with their presence in the countryside surrounding my home, characterize the landscape. One time after the first autumn rain, my mom and I, armed with a knife and basket, walked to the river in search of this delicacy. Along the river banks, at the base of the poplars hidden by leaves, we found these mushrooms and gathered them in bunches that looked like little families. After discovering these little families of mushrooms, we immediately collected the mushrooms of the same type. Honey mushrooms are best appreciated when combined with rice. Their viscosity is absorbed by the rice, transforming it into a tasty risotto. Over time many things have changed and I rarely find the time to search for mushrooms. The desire for a good risotto is still left and I discovered that frozen mushrooms, even thought they have less charm than freshly collected ones, still produce good results. Pour the water in a pot over high heat so that it is almost boiling. In a large saucepan, pour the olive oil and the garlic, turn on the burner, and when the olive oil and garlic is hot, pour in the frozen mushrooms. Cook for about 7 minutes on high heat, stirring often, adding a little salt and pepper. Add the rice and let absorb all the liquid well, only when the rice is very dry, add hot water and your choice of vegetable stock. Cook for 20 minutes, adding water only when the previous one has been absorbed. Turn off the heat and add the parmesan cheese, butter, and parsley. Stir and allow to sit for 3 minutes. 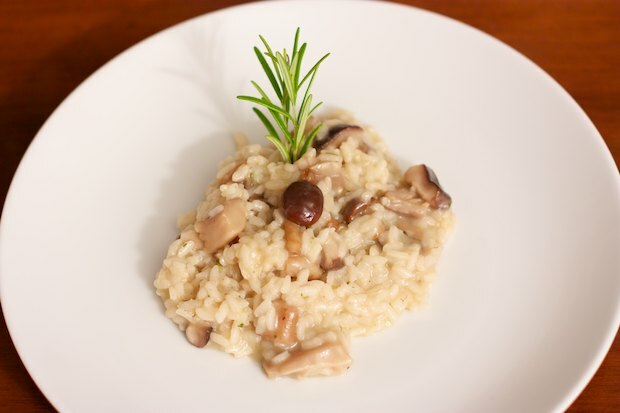 Posted in Rice and tagged with Risotto ai Funghi, Risotto with Mushrooms. RSS 2.0 feed. I just like the helpful information you provide on your articles. I’ll bookmark your blog and take a look at once more here frequently. I am quite certain I’ll learn many new stuff proper right here! Good luck for the following!